Tyrol looks to have taken Nicolas to see Dr. Cottle. 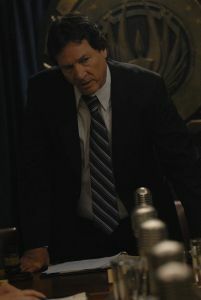 Kara and Gaeta look to being having an interesting conversation. Acting President Lee speaks to the Quorum. 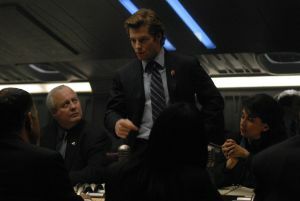 Zarek speaking to the Quorum, probably at the same meeting. 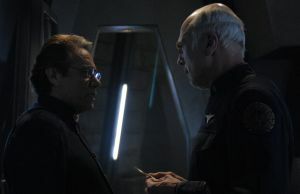 Adama and Zarek have a confrontation on Colonial One. 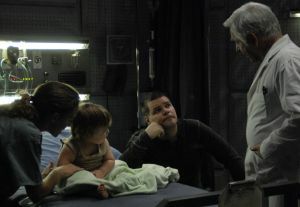 Based on this behind-the-scenes pic, Figurski and Adama share a sceen. 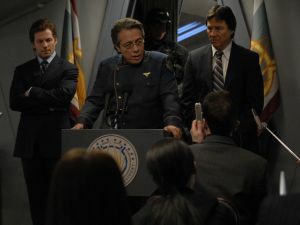 Adama speaks to the press as Acting President Lee and Vice President Zarek look on. 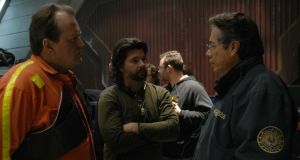 Adama and Zarek talk in Zarek's cell in the brig. 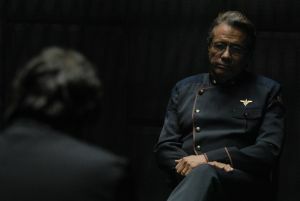 Adama gives Tigh a piece of paper. 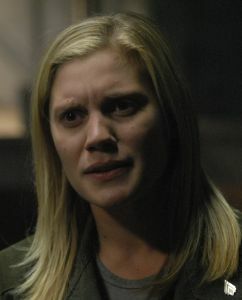 11/14/07: Katee Sackhoff says that episode 11 was filming the first week of November, which would lead one to assume that Ron Moore's episode is indeed episode 12. We'll leave it to you. From TV Tattler [This news fits with most of the previous spoilers (including the apparent filming schedule) except for Ron Moore's statements from below...unless he's treating the two-part mid-season episode as a single entity since he never actually mentions an episode number. 11/11/07: Looks as though the spoilers that we've attributed to this episode are actually for episode 11. 11/3/07: Moore is also writing the episode that he'll be directing.